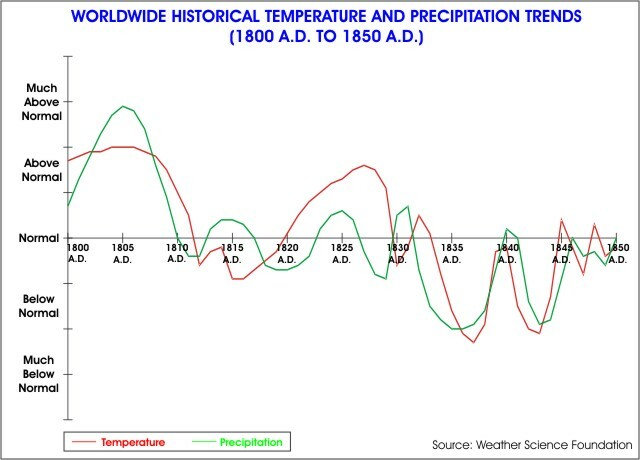 Historical Weather & Climate Timeline From 1800 A.D. to 1850 A.D.
1750 A.D. to 1800 A.D. | 1800 A.D. to 1850 A.D. | 1850 A.D. to 1900 A.D.
600 B.C. to 550 B.C. 550 B.C. to 500 B.C. 500 B.C. to 450 B.C. 450 B.C. to 400 B.C. 400 B.C. to 350 B.C. 350 B.C. to 300 B.C. 300 B.C. to 250 B.C. 250 B.C. to 200 B.C. 200 B.C. to 150 B.C. 150 B.C. to 100 B.C. 100 B.C. to 550 B.C. 50 B.C. to 0 A.D. 0 A.D. to 50 A.D. 50 A.D. to 100 A.D. 100 A.D. to 150 A.D. 150 A.D. to 200 A.D. 200 A.D. to 250 A.D. 250 A.D. to 300 A.D. 300 A.D. to 350 A.D. 350 A.D. to 400 A.D. 400 A.D. to 450 A.D. 450 A.D. to 500 A.D. 500 A.D. to 550 A.D. 550 A.D. to 600 A.D. 600 A.D. to 650 A.D. 650 A.D. to 700 A.D. 700 A.D. to 750 A.D. 750 A.D. to 800 A.D. 800 A.D. to 850 A.D. 850 A.D. to 900 A.D. 900 A.D. to 950 A.D. 950 A.D. to 1000 A.D. 1000 A.D. to 1050 A.D. 1050 A.D. to 1100 A.D. 1100 A.D. to 1150 A.D. 1150 A.D. to 1200 A.D. 1200 A.D. to 1250 A.D. 1250 A.D. to 1300 A.D. 1300 A.D. to 1350 A.D. 1350 A.D. to 1400 A.D. 1400 A.D. to 1450 A.D. 1450 A.D. to 1500 A.D. 1500 A.D. to 1550 A.D. 1550 A.D. to 1600 A.D. 1600 A.D. to 1650 A.D. 1650 A.D. to 1700 A.D. 1700 A.D. to 1750 A.D. 1750 A.D. to 1800 A.D. 1800 A.D. to 1850 A.D. 1850 A.D. to 1900 A.D. 1900 A.D. to 1950 A.D. 1950 A.D. to 2000 A.D.
Information from Weather Science Foundation.